decade. Generated data is growing faster than the ability of humanity to store it. In parallel with the explosion of digital data, our society has become critically dependent on services to extract valuable information from the data and drive decision making by individuals, businesses and government, across all aspects of life. In this talk we will give a short introduction to storage cloud systems, an emerging technology to deal with this explosion of data. We will continue with a description of the VISION Cloud project, whose goal is to develop a powerful infrastructure for the reliable and effective delivery of data-intensive storage services, while facilitating the convergence of IT, media and telecommunications. We will present the main concepts and innovations at the foundation of the VISION Cloud architecture, and demonstrate it through examples taken from the domains of telecommunications, media, healthcare and enterprise software. Hillel Kolodner is a Senior Technical Staff Member in the Systems Technologies department at the IBM Haifa Research Lab. Hillel holds a Ph.D. and M.S. in Computer Science from the Massachusetts Institute of Technology, and a B.A. in Mathematics and a B.S.E. in Computer Science from the University of Pennsylvania. 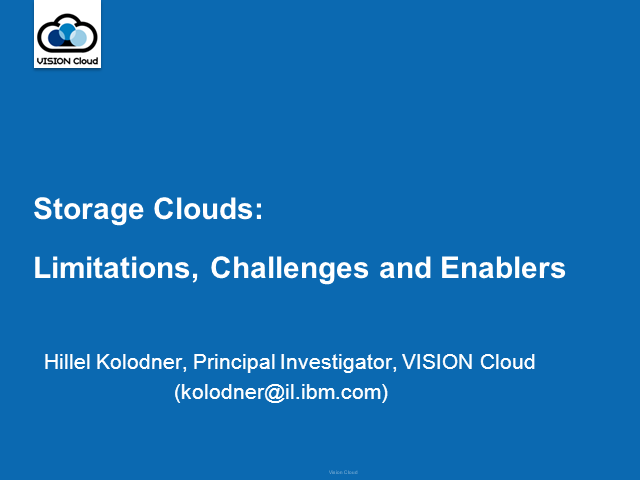 Currently, he is the principal investigator for VISION Cloud, an European Commission FP7 Integrated Project on storage clouds, where IBM leads a consortium of 14 partners from Industry and Academia across Europe.